Gary Merriman's saltwater box contains a little bit of everything for bonefish, redfish and tarpon. His original "Toad" pattern using a yarn body and "fluorescent yellow" rabbit strip tail has morphed into multiple colors and styles, including the very effective marabou-tail style. GARY MERRIMAN, who has owned The Fish Hawk fly shop in downtown Atlanta for thirty-five years, considers himself more of a sportsman than anything else. “I grew up hunting and fishing, doing it all. Of course when I heard about the Florida Keys as a kid, all I wanted to do was go down there and fish. I drove my parents nuts with the idea until they finally said ‘OK. '” And so began a unbroken string of tarpon and bonefish seasons that has taken Merriman, now in his early fifties, back to test flies and strategies that have won him a place among the important innovators in saltwater fly fishing. Although he’s been fly fishing the Keys since the early 1970s, it was Merriman’s use in the early 1990s of neutral-buoyancy flies that swam — rather than classic patterns which rose and fell in the water column — that changed the sport for him and for the many anglers and guides who later picked up on the idea. “Of course the idea was kept secret,” Merriman says, “not by me, but by my guides and the other guides who watched us catching all the fish.” Merriman got the idea when fishing for bonefish with Harry Spear in the late eighties. Spear had concocted a flat-bodied bonefish fly for super-spooky upper Keys bonefish that hit the water very lightly yet had enough bulk to entice a big fish to bite. Spear’s “Tasty Toad” featured strands of yarn tied flat across the shank and trimmed to various profiles (an idea that probably drew inspiration from Del Brown’s 1984 Merkin permit fly). Merriman's tarpon "Toad" pattern was one of the first patterns used in the new style of neutral-buoyancy fly presentation. In addition to the other colors of Toad that Merriman uses now, he’s also still a big fan of Steve Huff’s ballyhoo fly (top row, second from left) and various styles of Enrico Puglisi fiber flies. “I asked Steve once what color fly he used, and he said ‘All I thrown is white.’ Since then white or white and chartreuse Puglisi-fiber flies have always been the box.” By the way, Merriman’s favorite tarpon hook is the Owner 5180 (2/0 or 3/0), and the Tiemco 811S is his favorite for redfish and bonefish. “The fly in the upper left of the right-hand side is a Jim Dupre Spoon Fly. It seems to catch fish everywhere. 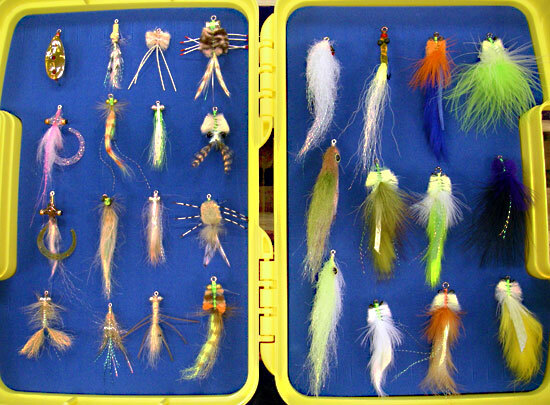 To the right of that is a modified puff with varying types of weight for bonefish, and next to the classic Merkin on the right is a leggy Merkin-style fly. I really love legs on flies. The second row in the left holds a squiggle-tail redfish fly with epoxy head — my alternative to the Spoon — and then to the right of that is my favorite bonefish fly: gold bead-chain eyes, furnace hackle and barred fiber tail. Next to the barred-tail fly is a standard clouser, which I really don’t go anywhere without. And to the right of that is a ‘Sandy’s Cracked Crab’ by Sandy Moret. In the third row is another squiggle-tail redfish fly, a tan-brown variation of my favorite bonefish fly, Henry Cowen’s Shrimp Scampi, and and an Isley-style permit fly. Don’t get the idea that I like to permit fish, though,” Merriman said.